Compatible with Microsoft Skype for Business/Lync, Yealink UC Edition SIP-T22P is the cost effective phone that extends Microsoft Skype for Business/Lync benefits. The phone features an intuitive user interface and enhanced functionality which help people to collaborate easily and maximize productivity. 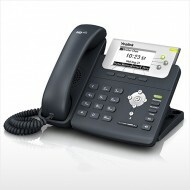 Yealink HD technology enables high-definition voice quality, other benefits include outsourced management options, flexible deployment and third-party communications applications, all helping users to streamline business processes, delivering a powerful, security and consistent communication experience.